An anxious, young man walks onto the stage, picks up a chair and proceeds to nervously take off all of his clothes and sits on the chair naked before addressing an unseen person. He soon realises that he doesn’t need to be naked and gets dressed. The set is fairly minimalist with three chairs, a table, a bench and at the back are some blank artists canvasses. A few minutes later, a middle-aged woman appears, takes one of the chairs, sits on it and ignoring the man, proceeds also to talk to the unknown person, apologising for wearing a different outfit this time. 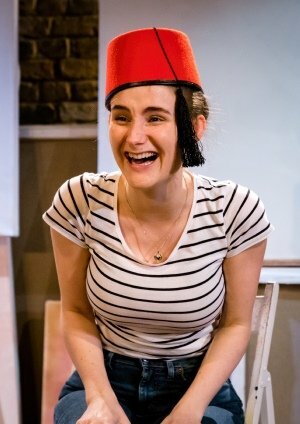 Finally, a young girl appears, ignores the other two, takes a chair and she too addresses the unknown person, asking him (for we now know it’s a man), what she should wear, taking various items of clothing including a fez out of a large bag. It soon becomes clear that the three are sitting for an artist (who we never see) called John and are having their portraits painted. It’s also apparent that they’re there at different times and are alone with the artist. They proceed to bare their souls as they sit whilst the artist paints. The young man “Luke” (played by Mark Weinman), moans about his lack of a job, his home life, his pregnant wife, and his recently deceased mother. He gets all the funny lines including a superb joke about trying to make love to his wife and his mother’s ghost – she’s not dead! The middle-aged woman “Mary” (Hayley Jane Standing), seems very needy and tells a very sad story about her sister who dies when she falls under a train. She seems to have led a very sad life and the pathos pours out of her as she can’t stop talking and doesn’t let John get a word in edgewise. The young girl is an aspiring actress “Cassandra” who seems to have an agenda as her story shifts, her name changes and we learn more about her motive for being there. Sitting is written by BAFTA-winning actress Katherine Parkinson who couldn’t be at the first night as she’s currently on stage at the Duke of York’s Theatre in “Home, I’m Darling” which is a shame because she missed a superb evening for everyone involved in the play. What could have been a series of three monologues a la Alan Bennett, isn’t, as the dialogue overlaps and occassionaly synchronises. There’s laughter, pathos and poignancy (and Jaffa cakes) all superbly wrapped up in a delightful, thought-provoking seventy minutes. All of the performances are superb and director Sarah Bedi should be congratulated for giving life and energy into what is basically a fairly static piece – it’s mainly three people sitting on chairs and talking to a character we don’t see. Mark Weinman is terrific as the edgy “Luke” and even while he isn’t speaking, his body is twitching, and his eyes betray his nervousness. In contrast, Hayley Jane Standing as “Mary”, moves very little when she’s not speaking, staring wistfully into the middle distance but hers too is an excellent performance. Poppy Fardell as “Cassandra” has the task of moving the plot along and she does so perfectly, bringing a knowing quality to her young character. Sitting may sound like it’s just three people sitting around, opening up their deepest thoughts and baring their souls to a complete stranger but all is not what it seems as there’s a twist in this tale. And as with John’s three portraits, all will be revealed at the end. Sitting was a big success at the Edinburgh Fringe and deserves to be again during its run at The Arcola as it’s an inspired piece of writing, brilliantly directed and performed. Katherine Parkinson is an Olivier Award nominee for her role in Home, I’m Darling (National Theatre) and a BAFTA Award-winning actor, whose credits include The IT Crowd (Channel 4), Doc Martin (ITV), The Honourable Woman (BBC Two) and Humans (Channel 4). Sometimes emotional, sometimes poignant, sometimes funny, Parkinson has turned her talents to playwriting for the first time in her extensive career. Sitting was originally directed by Sarah Bedi and produced by BBC Arts and Avalon at the 2018 Edinburgh Festival Fringe as part of an initiative to encourage writers from genres outside of theatre to write for the stage. Arcola Theatre presents Sitting in association with BBC Arts and Avalon.